The winter in Lapland was two weeks late but when it finally arrived last weekend, along came the diamond dust. 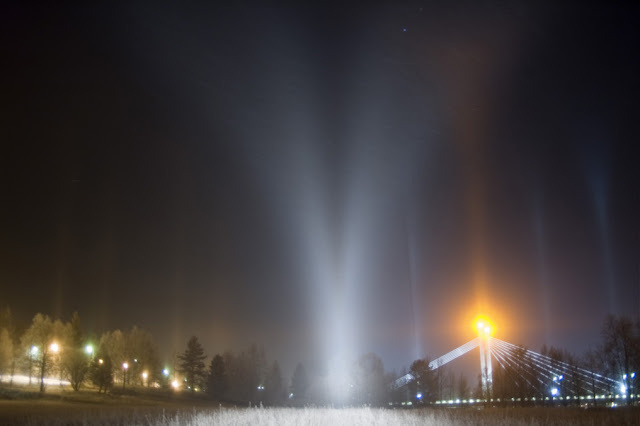 Decent displays were seen here in Rovaniemi on two nights and one day. In the night time I used a bright lamp to create the halos. The photo here is from the second night showing the anthelic region with diffuse arcs. More photos, including all sky views, will follow some time later when I am done with them. Marko, this is simply magnificent. Beautiful diffuse arcs. Congratulations! Stunning diffuse arcs! You did a perfect job! Awesome!! Just totally awesome! I have not seen any good halos since the last display that showed the blue spot. I just hope this year I can make to the power plants near the river this winter when the subzero temps I have always dreamed of super halos. Let me know when photos are online.